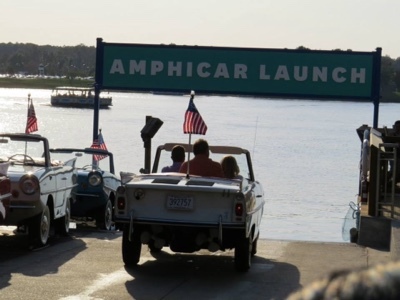 Orlando Visitor: Amphicar Ride at Disney Springs, Orlando, Florida. Amphicar Ride at Disney Springs, Orlando, Florida. 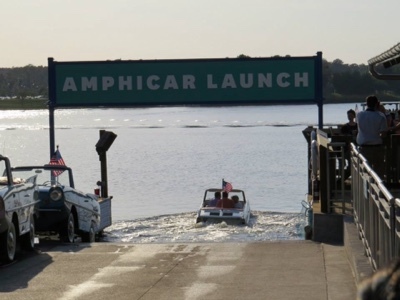 An attraction that gives you a different nautical experience, would be the Amphicar at the Boathouse Restaurant at Disney Springs, Walt Disney World Resort Orlando. Climb aboard the 'car' and the Captain 'sails' you on a 20min water tour around Disney springs. Reviews I've read have said it is expensive but well worth it for the unique experience! Labels: Amphicar. Disney Springs. Orlando. Florida. The Boathouse Restaurant.